Gunpowder was first mass-produced in the United Kingdom at Kent, specifically Faversham, which remains a center of the trade in 1916, still cross-cut with small canals used to float materials between processing plants in the 17th Century. More recently, however, spring has been quite dry, so the tall grass in the fields outside factory number 7, Explosives Loading Company Ltd., is easy tinder for a spark. This afternoon, employees detect a fire in the grass and move to extinguish it. The assistant manager, a Mr. Palowkar, immediately sounds the alarm. While the cause is never known, the report from His Majesty’s Inspector of Explosives concludes that burning ash was carried from a chimney on the site; illicit smoking is another rumored explanation, as is German sabotage, which seems unlikely. Whatever the cause, the grassfire spreads fast, and although the gunpowder factory is state of the art, there are no real firefighting facilities. The Works Fire Brigade arrives with their manual engine to find workmen frantically trying to put out the flames with a bucket-chain, drawing water from the nearest canal; they are all too late. As reconstructed later, the flames reach empty TNT bags piled up outside building 833, a process house containing 15 tons of the high explosive. Making matters worse, 150 tons of ammonium nitrate — a compound not understood to be explosive at the time, but which has since been used to improvise hugely destructive bombs — is piled up against the opposite side of the structure. At about 2:20 PM, the British munitions industry suffers the most catastrophic explosion in its history. It is actually a series of explosions, much like a string of mines exploding under a trench or a battleship’s powder-stores detonating. Men who survive the first moments of destruction are consumed in a flash the very next. 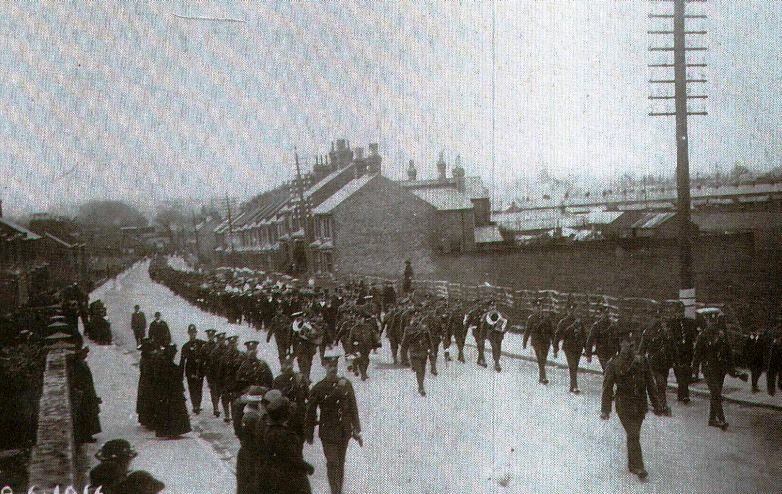 Most of the workers, who are only now abandoning the scene of the blaze on the orders of factory manager George Evetts, and the entire firefighting crew are caught in the fireball. In all, at least 109 men and boys are killed. 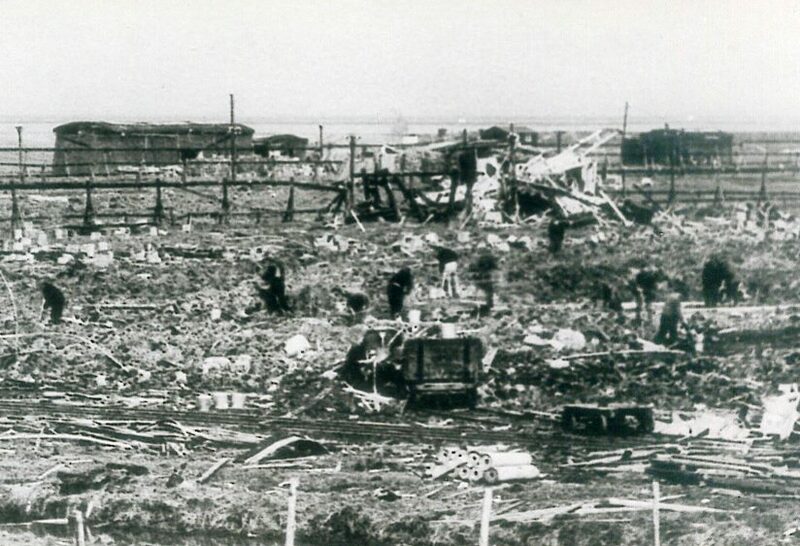 Bodies are later plucked from the marshes and canals during recovery operations (see above), with at least seven left unaccounted for; it is presumed they were atomized by the intense pressure and heat. An adjacent plant belonging to the Cotton Powder Company is severely damaged. Crossing the Thames, the blast wave shatters windows on the Southend-on-Sea waterfront. Leaving a crater 20 feet deep and six times as wide, the explosion is so powerful that it is felt in Norwich and heard as far as Essex and Sussex. As the mourning begins, it is clear that shortages of water hydrants and trained firemen allowed the fire to burn out of control. A century later, we take much of the fire safety revolution for granted; building codes and safety regulators require so many fire extinguishers just as passenger liners were made to carry sufficient lifeboats after the Titanic disaster. Moreover, fireproof materials, safe wiring, and other modern conveniences do not exist in 1916, with a commensurate number of massive fires. The Canadian Parliament building was entirely gutted by an accidental blaze just two months ago, for example, as was an enormous steel shop in Pennsylvania last November. Safety inspectors also determine that a number of workers had loitered on the site, ignoring instructions to clear out. As most of them lived some distance away from Faversham, officials assume these men were spectating in hopes of being able to get back to work rather than begin their homeward commutes. Human errors and wartime demands also share the blame: by expanding production with less-skilled workers, the Ministry of Munitions has managed to meet unheralded quotas for guns and shells, but at the expense of safety and workplace hygiene. It is hardly the only example of slipping safety standards during the war: last year saw two deadly rail accidents in which obsolete, gas-lit train cars turned into rolling bombs. 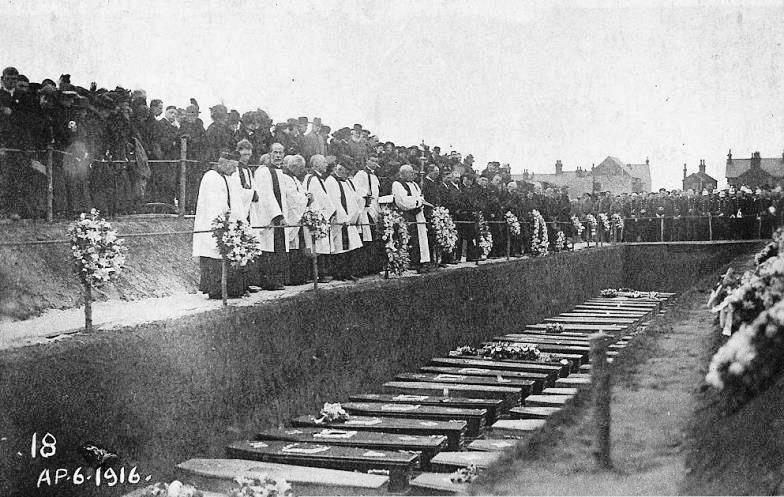 While Minister of Munitions David Lloyd George and the royal family acknowledge the Faversham community’s sacrifice for the war effort, the matter is never reported in newspapers, for the British government does not want Germany to know about disruptions in their supply chain for high explosives. A mass funeral for 69 victims is photographed, but not acknowledged in the press until more than a year later.